In the dead of winter, when it’s bone-chilling cold, the ground is frozen and wildlife are burrowed away, that’s when restoration crews are hard at work deep in the Forest Preserves of Cook County. 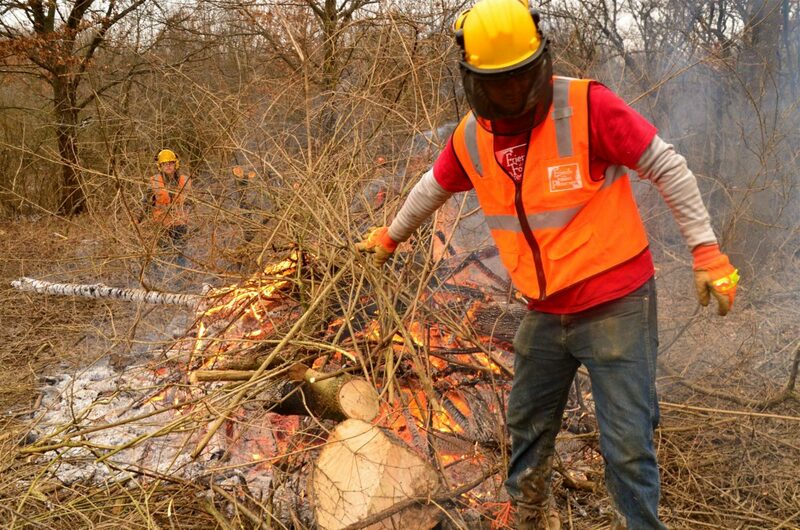 On a recent morning in Spears Woods, a five-person Forest Preserve Leadership Corps crew took turns tossing freshly cut armloads of brush onto a red-hot burning pile. White smoke flowed gently upward and perfumed the frigid air. This work requires painstaking labor. And knowing how to use the proper tools. And, on a day like this, crew members must be properly outfitted from head to toe. Ladejanae Robinson-Goode looks every bit like a pro. She expertly describes her gear: “I have on waterproof leather steel-toe boots that cover my ankles,” she explains. “And chaps. Those are padded leg protectors that are ideal for the brush cutting she’s doing. “I’m also wearing heavy-duty gloves, and a helmet with ear protectors” to muffle the loud roar of the chainsaw she has to use to get the work done. Previously, Ladejanae, 19, volunteered as a Youth Outdoor Ambassador. In that role, she took on speaking engagements and did youth outreach and tabling events. The Harold Washington College freshman joined this crew in Spears Woods five months ago. “I wanted to be more hands-on and in the field and get more involved with physical work,” she explains. Corps programs reduce the density of invasive woody plants species to less than 15 percent, which in turn increases native plant diversity and the number of species of plants found in the preserves, says Alice Brandon, resource programming manager for the Forest Preserves who oversees the Corps program. CCLC staffs a year-round crew in the biodiverse Palos region, the preserves’ largest contiguous area, covering more than 14,000 acres of land. Leadership Corps members, who come from all over the county, have graduated from high school, are in college or taking time to weigh career goal. They gain valuable technical and leadership skills that go beyond their Corps experience. Crew members work a paid 30 hours a week four seasons a year. Some, like Daiva Gylys, are truly seasoned Corps leaders. The 27-year-old became acquainted with conservation work in 2012 as an intern and now manages the roving crew in Spears. As the brush fires crackles behind her, she talks about her tenure. Daiva studied at the University of Michigan, where she earned degrees in environmental science and socio-cultural anthropology. “The most impactful thing for me has been to work with such awesome people and seeing them come and go but staying involved in the conservation community even after they’ve gone through the Corps program,” she says. A member of the crew for just three weeks, Taylor Polanski, 24, considers himself the newbie. He’s a graduate of Benedictine University, where he majored in environmental science. Last summer he did an internship with Audubon Society working on a restoration crew. Being in the Leadership Corps is his “first environmental job.” He aspires to become a crew leader. That’s six years and counting. 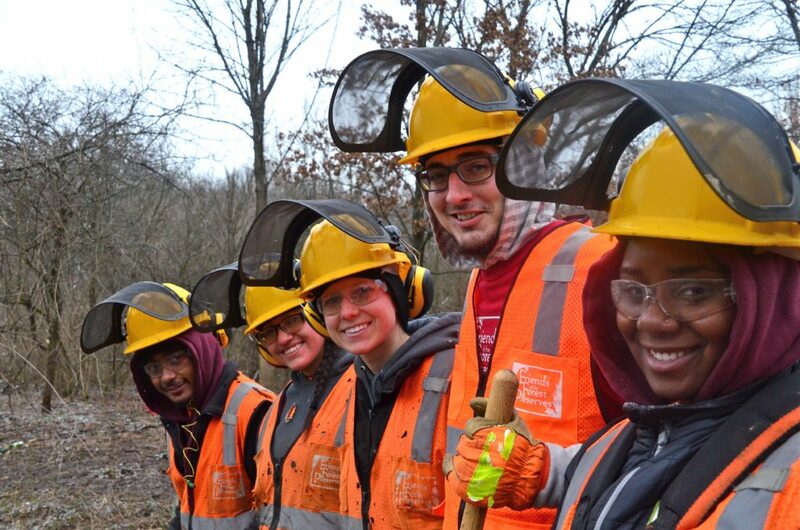 Read more about the work the Conservation Corps does in the Cook County Forest Preserves.